We spoke with Ashley by phone in May 2017 and email in October 2017. Ashley is 24 years old. She helps people engage in participatory budgeting (PB). In PB, regular people decide how to spend public money. Ashley helps young people, teachers, principals, city staff, and elected officials, such as the mayor. She learned about PB three years ago while she was a student at Arizona State University. Now Ashley takes her learning around the world. She is grateful to work and learn with people who make their communities stronger, challenge injustice, and reshape democracy. Participatory budgeting (PB) is a way to give real people real power over real money. People use PB to help their communities. In PB, people in the community are the experts. They know the kinds of changes that will be best, and they use PB to decide how to spend public money to make their schools and neighborhoods better. Usually, when working with budgets, representatives of the people decide what those people need. PB allows everyday people to decide how to spend public money to improve their lives. How did you learn about PB? When I started at Arizona State University, I was confused about “what I wanted to be.” I was not sure what I should study. I knew I wanted to learn more about how identities affect the way people interact, and thought I could use research to do that. I began a research project that became my honors thesis. In the process, I worked with a committee of two ASU professors who focused on civic engagement. While I researched ways that young people were building relationships and building peace, I learned about participatory budgeting (PB). I received grants that allowed me to travel and do research. I took a Romanian language class; this helped me in interviewing PB participants. I learned about the first youth process in Romania. There, young people with different ethnic backgrounds and religions worked together to decide how to spend public money to make their communities better. In Romania, I interviewed 50 young PB people participating in PB. I talked with city staff and partners who lead the PB process. I returned home to Arizona with stories and questions. I also had a deeper appreciation for the teams who design and run PB around the world. After doing research in social psychology, political science, and religion and conflict, I realized something. Even though ideas fascinate me, I needed to do more than just study PB to make real change. I became inspired, and I began to observe and support PB at Bioscience High School in Phoenix. This is the first high school in the U.S. to do PB in a school setting. What other career options did you consider? Before I studied youth participatory budgeting (PB) in Romania and supported school PB in Phoenix, I dreamed of getting a Ph.D. in social psychology. I thought I would work in a college or university. I was sure this was the only path for me to follow. Maybe this determination stemmed from the fact that many of my mentors were professors. Their shoes were the only ones I could imagine a future version of myself wearing; I had no idea there were so many other types of shoes out there! Spending time with new mentors who were leading PB with young people left me with dreams of pursuing a new, but still related, path: I now dreamed of doing the work I was previously researching. What work are you doing with PB now? At the Participatory Budgeting Project, I train and support teams of people who lead PB around the U.S. and Canada. These include city workers, teachers, students, nonprofit partners, and community members. Through this work, I have seen people who lead PB in their schools and communities learn about democracy by doing democracy. Many students and community members participate in their school or neighborhood in new ways. I have watched them grow as leaders, learn about budgeting, and become more aware of ways to address needs in their community. They also have stronger critical thinking, researching, and public speaking skills. I recently helped launch and lead PB in 10 public high schools in the Phoenix Union High School District. This is the first school district in the U.S. to do PB using school district funds. (Check out these students in action here and read about their work here!) There was a lot of PB success in these schools. The outcome that stood out most to me was relationship building among students, teachers, and staff who participated in the process. During the school year, students who participated in PB developed as researchers, team members, leaders, and advocates. They also became friends with students they had not interacted with before. The teachers who were PB advisers built relationships with students they did not see in their classrooms. Beyond these connections, schools created new kinds of partnerships with school district staff while they worked together to decide how to improve their school communities. In 2017, I began to plan an Innovations in Participatory Democracy Conference. The conference was held in Phoenix, AZ, in March 2018. It brought together 250 people from around the world. Participants included community leaders, government officials and staff, practitioners, researchers, funders, young leaders, and technologists. I was most excited to hear students and teachers tell their stories about the ways that PB has affected them and how it has changed their schools. As PB changes and grows, I look forward to supporting more students, teachers, and community members. It is rewarding to see them make the changes they want to see in their communities and work together to make them happen. 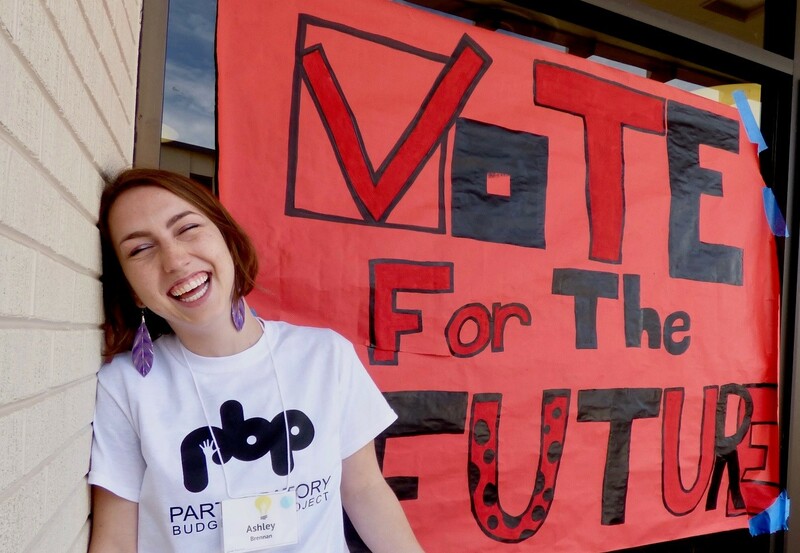 Blog: What happens when students lead PB? This blog post features high school and college students sharing how their involvement with student organizations gave them the chance to discover their passions and develop the skills they will need in their careers. Learn about internships and other career development opportunities in the federal government for current students and recent graduates. Some pathways programs give graduate and undergraduate students the opportunity to work part time and transition smoothly into a job after school.